Heartstring, Verde and Tea Leaf had a battle occur within the boundaries of the Crystal Empire. They had come across a Dark Crystal Death Worm brought forth by an unsavory bunch. A bunch which resides within the darkness where eyes can see. This battle caused a lot of destruction to the Crystal Empire, particularly towards the Warehouse District so there was less loss of life thanks to the quick thinking minds of our Heroes. They bought sometime before the Crystal Empire army had arrived to assist, but still they were no match for the Worm. Much of what they done had only served to annoy the beast, till Heartstring came in one fell swoop, thanks to the assistance of Verde and Tea Leaf buying him time, with him Kirin spell that allowed him to burst forth an enormous amounts of power into a single strike. While this lead to the defeat of the worm, it left one of our heroes greatly injured. Tea Leaf's like parasitic buddy perished alongside with the Worm, leaving behind some unsettling thoughts to Tea Leaf's mind. A parasite that didn't wish to become part of it's other half, a part that didn't want to return to the darkness that accepted death as it's escape. What could this mean? Thoughts to be pondered over the time where a Medical evacuation platform arrived by a squadron of Medical ponies and a strange robed pony. One of the Medical ponies was revealed to be the Mother of Heartstring and bring both Verde and Tea Leaf along she took them to where they transported Heartstring too. The trip over didn't feel long, but that was all thanks to the Arch Magus Pony that was along the ride with them, a Darkly Robed pony that managed the transportation between the Crystal Empire and Occultae Veritatis, or Occultae for short. The location of this place was a secret to the known world. Very few ponies knew about it that didn't live within. Far into the Crystal North, deep below the highest peak is a hidden entrance to Occultae. The inside of this underground cavern is spectacular and ginormous. There was quite a number of ponies there; Primarily Unicorns, but there were also Earth Ponies and Pegasi pony, but there beyond the race difference there was something that was in common with them all and that was the markings they all had. There were many along the older members that had markings painted on, while there were many of the younger ponies who had these markings naturally, much like Heartstring. So it was simple to tell who was from here and who was not. There was this mystical appearance to this place as if the place was very meticulously carved in such a way that there was a smooth appearance to everything. The roadways spirals and swirled every which way leading to the various levels of the underground city. Each sector of the city lit by Magical lamps that floated in mid air. The lamps themselves were spherical cages of sorts that seemed to float upon it's own power, and within the center of the cage was a heavenly flame that burned with no heat emanating from it. A lot of the homes were large bulbous shaped buildings, almost like Hersey's Kisses shaped. Many homes were single story, but there were few towards the upper sectors of the city that looked to be multi-leveled homes. Of course it was glaringly obvious that the larger homes were for the more important figured within this society and this became prevalent to Verde and Tea Leaf, when after they had been brought here, they had been led by Cherish and the robed pony to the upper sectors. They would have been brought to a large home that looked to have five other homes attached to it. 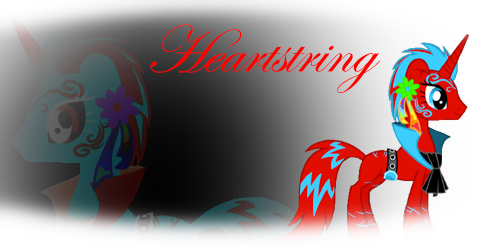 Of course this had been revealed to be all part of the same home and at the same time, the robed pony was revealed to be Heartstring's father, Mystical String. Mystical String had the same strong red coat color as Heartstring did, but he did seem to be built on the more muscular side and was about as tall as Heartstring, if not a bit taller actually. His mane however was as dark as night, and seemed to have a shimmer of blue to it when light hit upon it. He usually wore a robe all the time within the house. He was a unicorn, though his Horn wasn't quite as long as Heartstring, but it wasn't short either. Mystical had a deep strong voice, but much like Cherish and even Heart, he also seemed quite capable of sounding kind and gentle in his tone. Verde and Tea Leaf had been given separate rooms to sleep in, the rooms were next to each other, both quite spacious and obviously were set up in a means to be 'guest rooms'. Small bookshelves in one corner of the room, a coffee table, a potted plant in the corner, and a simple bed. Along the wall there were landscape paintings in place, gorgeous works of art that seemed to be an abstract take upon the Crystal North's barren frozen landscape. They both had large crystal doors that slide open and led out to a balcony that connect with the room next to it. So Verde and Tea Leaf could meet out on the balcony if they wished. Heartstring was at the near by hospital, which Verde and Tea Leaf were free to visit should they choose too. Cherish and Mystical had a number of Maids and butlers to manage and tend to the house when they were busy at work. It would have been over a week before Heartstring had regained consciousness, during the time that Heartstring was unconsious Verde and Tea Leaf were questioned after two days of arriving to Occultae about the incident, afterwards they hadn't been bothered by it. Well Tea leaf had been given a rather thorough examination after revealing he had touched a black crystal and it attached itself to him. The result of the examination showed him to be clean of any parasitic side effects and there wasn't any worry of there being any ill effects to pop up. After that, the two would have been free to wander as they pleased around the city and are free to stay until Heartstring woke up if they desired to as well. Mystical had also offered to the two to explain what had occurred at the Crystal Empire more properly, but only when Heartstring woke up. Tea Leaf idly hoped from rooftop to rooftop, flipping completely over in mid-air on some leaps and other times, especially when the buildings more odd dimensions through him off, simply making a straight leap; the thief had been noticeable subdued ever since arriving in the city, though his eyes had widened and his jaw dropped when he had first seen the majesty of the area around them he had been otherwise very quiet compared to his confident, boastful self that Verde and Heartstring had met in the Crystal Empire. The thief had found a use for the multi-connected house at least, using it's various roofs and windows to leap into to keep his skills sharp while they waited for Heartstring to recover; the thief had been to the unicorn's room several times but had been unable to make himself stay for very long on any of the visits, guilt overtaking him pretty quickly everytime he had to look at his new friend laid up in a hospital bed. Deciding he was done for the day with his exercise, the thief gracefully leaped back to his own balcony and slid the door open, deciding he would head down to the market for a little bit. After he put on his saddlebags he went next door and knocked on Verde's door, for some reason he found that he didn't feel like being alone lately, even though he had always preferred that previously. Verde hums musical notes as she lounges on the bed she was given, hard at work with a sketchbook, ruler, engineer scales, compasses, and other instruments of drafting. The staggeringly large and heavy accumulation of tools, spare parts, food, clothing, and pretty much everything else an adventurous mare could conceivably need but would (normally) be insane to actually carry on an adventure are set on the ground to the side of the bed furthest from the door, tidily supported by the carrying frame that makes it possible for Verde to move under the heavy load of all her things. Most of her days thus far have alternated between tending to basic needs, sketching out detailed mechanical blueprints and studies in her room, and sketching more or less the same thing in Heartstring's hospital room. Whenever Tea Leaf had visited, she'd immediately turned away from her work and made sure to smile at him and be as welcome and open as possible with the thief, and Tea Leaf would get the distinct impression that she was disappointed that he wouldn't stay long--not disappointed in him so much as just disappointed. Verde wasn't quite sure why, but there was something about the handsome stallion with the distinctive hat that she liked. When said stallion knocks, he finds the door pulled open before his hoof can tap the door more than twice and Verde is standing there smiling pleasantly, her drafting supplies spread out visibly on the bed behind her. "Hoodwink, what a pleasant surprise!" She looks him over, noticing the saddlebags. "Going out on an adventure then?" She pauses thoughtfully. "No, that would be silly, never mind." Another pause. "Going off shopping then?" "No I'm just off to retrieve the Lost Idol of Griffonstone, should be back before tea." He chuckled, not having the heart to be truly as sarcastic and deadpan as he intended; true the Idol was very much on his to-do list but that didn't need to be common knowledge lest anypony start getting funny ideas. "I figure we're in a new place, it wouldn't hurt to check the marketplace, if only so I don't have to jump between the same rooftops anymore." The stallion stood back to allow Verde to step past. "You're welcome to come if you like. To be honest, I wouldn't object to the company, it's not often I have actual companionship when I travel." He said honestly. "If you were to tell me that and mean it, I'd believe you entirely," Verde admits as she steps out of her room and closes the door behind her. "Somehow, I entirely believe that a gentlemanly sneak thief with an excellent hat would decide to find and lift something lost, valuable, and very much legend-burnishing." She looks thoughtfully at him as they start towards the market. "You should fix that, eventually, when you find your feet a bit more firmly. Our fantastic fright night, with an out-of-bucking-thin-air display of power from a stallion that radiates fabulous, made you look like a stallion that works well with some quality backup." She then grins. "Engineer, thief, and hitting power... I don't know about you, but it seems like a winning combination to me." "Heh, usually I have a hard time getting bartenders to believe I paid my tab, nevermind something that far fetched." Tea Leaf chuckled, following alongside Verde and subconsciously flicking his mane, and by extension his hat, when she complimented him. When he heard her talk though, he stopped the showboating and considered it. "I dunno, so far me and company go together about as well as earth ponies and flight." He remarked. "Short of one mare I didn't really have any fallback partners until I bumped into you two, and even she can be a bit.... problematic." He said, feeling in his head how much of an understatement this was; when they reached the marketplace he immediately wandered over to a smaller stall, ignoring the fancier shops and more dazzling looking stalls for the smaller, shabbier side of things selling small statuettes and exotic looking gemstones, a zebrican brewing stall especially took the interest of the thief who, judging by how he had fought at the Crystal Empire, was obviously somewhat proficient in the art of potion brewing himself. "Maybe I'm just gullible," Verde says cheerfully, sounding as if the prospect doesn't bother her at all, "but I saw your rope setup and how you worked the shop you were robbing when I and Heartstring showed up. I could see that setup getting you to some idol thingabob even if it was hidden and trapped or something. Or maybe something far more gaudy and valuable with lots of pretty gems and gold that you could fence for your weight in bits." She shrugs. "But I'm an engineer with a crowbar and a machete and carrying obsessive-compulsive amounts of tidbits, baubles, tiddlywinks, and rot so what do I know about the thieving life anyway?" Verde perks up with interest when he mentions the problematic mare. "So, a mare that's a problem. Seems kind of typical if you ask me, meeting a femme fatale that's a whole boatload of trouble. So what sort of trouble does this mare of yours bring?" She splits off about the same time he does and makes for any shop selling anything that looks like it might have been engineered or crafted with moving parts and especially anywhere that's selling any kind of raw metal materials or finished knicks, knacks, and parts. "Femme fatale... yeah not quite what I had in mind." Tea Leaf laughed, imagining anyone ever using that to describe Razor Back and trying to imagine how long they would have four fully functioning legs. "More like she gets the attention of everybody in every Inn and Pub I've ever stopped in, in the worst possible ways, and yours truly gets the brunt of it." Despite the complaining, there was an unmistakable note of fondness in his voice. "She was actually meant to be in the Crystal Empire with me but she decided to actually apply for the royal guard of all things. I can only imagine what her captain will think when she shows up." The stallion chuckled, purchasing himself some deadly nightshade and powdered dragon teeth for use in potions to counter the effects of poison joke; he would need to brew some of those antidotes before he made himself anymore gas bombs from the tricky plant. "What about you, any friends wondering where you are?" He asked Verde once he had bought his fill. "Ah, so she's a walking talking fight." Verde grins. "I've got a cousin like that, and she learned it from me. I turned it off after school because by that time, she could break legs to make a point without my help." She chuckles. "I wonder if the Royal Guard know what they're in for? Maybe a sneak thief with a great hat should warn them." Her tone of voice makes it abundantly clear that she doesn't mean it. "The only friends I have are my two aunts, my cousin, and my marefriend with the last two being the same pony." She pauses a moment to build on how weird that sounds. "It's not what it sounds like, honest. I have a really strange family structure where some of my cousins are the kids of my mother's birth brothers and sisters, and my other cousin is the kid of my mother's adopted sisters and thus not my cousin by blood." "Walking yes, talking usually takes a backseat to her hitting things." Tea Leaf chuckled, examining a strange turquoise crystal which seemed to be subtly changing shape in his hoof. "Probably not... and you'd be right, unfortunately I don't see any sneak thieves around here, do you?" He asked with a wink, putting the turquoise crystal back and paying a few bits for a crescent moon shaped crystal which refracted the light that hit it, producing a continuous rainbow coloured aura around it. "You think Heartstring would like this?" He asked, holding it up for her; evidently the stallion still felt a bit of guilt over what had happened at the Empire. "Figure I owe him, well, more than one really after the fiasco back there. Shiny things are usually a good place to start." He cocked an eyebrow at her family situation but didn't say anything to it, for some reason his mouth twisted into a scowl for a moment when she mentioned family but he quickly returned to his usual expression of calm confidence. Occultae Veritatis was was the resourceful hidden city. Although they kept to the shadows, it was quite evident from their market place that they didn't exactly keep to themselves, it was most certain they had some sort of import going on between the city itself and other places. It's possible the Merchants here either left for a time and returned after refilling their stock, or they may hold some sort of connection with the places the various items came from. Food, knickknacks, charms, magical artifacts, it was a whole bazaar of products from various places across the continent. There were very few items that looked to have come from other kingdoms. Though it is safe to say that Tea Leaf and Verde both were being given looks, but they weren't particularly bad looks. It was more so those kinds of looks where everyone just knew they were outsiders and were just cautious. But this was also probably evident in the fact that everyone here were covered in markings, much like Heart and his family were. Though the markings on everyone else varied in different ways, but if one was attentive enough, you could tell that people of the same family seem to carry the same marks upon their faces. "I have to admit, it's a nice change of pace to just be given the looks with my hat and cape on; usually by this point someone has ran off to a guard." Tea Leaf was aware he wasn't being especially subtle about the fact that he was the infamous Hoodwink but after seeing a creature that looked it had come from the nightmares of Windigos themselves, not to mention being in a completely unfamiliar and mysterious city, it wasn't exactly a priority in the stallion's mind to preserve that secret right now. Even if it got out after all, there were far more important things to be focusing on right now. "Shall we go and see how Heartstring is doing then?" Tea Leaf asked Verde as he slipped the gem he had bought for the stallion into his saddlebag. Verde nods along as Hoodwink talks. "I think that he's so fabulous, with that mane and all the markings and colors, that any shiny object he happens to wear will just enhance the overall fabulosity until even stallions become weak-kneed at how incredibly pretty he is." She giggles at the notion of this before her eye catches the slightest scowl passing momentarily over his features and the merriment drops. "Um... yes... so..." She shifts uncomfortably between hooves. "Yes, I imagine it's nice not to be reported to the guards just because you're dressed like a gentlestallion set to steal the hearts of mares--and then clean out their jewelry when they're sleeping off the fun night." Her eyes twinkle a little. "Although I imagine that ponies here aren't trying to report you because unlike random civilians, they don't fear you." At his question, she nods rapidly and beams. "Yes, let's go see the hero of the city and make him more shiny." "Not sure why random civilians would fear me to begin with to be quite honest with you." Tea Leaf shrugged as he set off at a leisurely stroll with Verde towards the hospital, having to pause at every side street and corner to make sure he knew where he was going; it was actually harder for him to find his way around at street level than it was on the rooftops since that was where he had lingered since their arrival. "I mean, I hardly cut an intimidating figure." He carried on, holding up one of his own fairly skinny legs compared to a usual earth pony anyway. "Unless someone has mistaken the phrase sharp dresser to be literal I really don't see how I'm the least bit worrying." The hospital was one of the few buildings that looked to be just slightly different then the others. With runic symbols embedded into the building itself. It was magically fortified, in fact the building itself seemed to be a bit more square in it's shape with a few buildings attached to them each one being a slightly different shape all surrounding a central building that seemed newer in comparison with the others whose shape resembled the rest of the buildings of the city. The hospital was called Occultae Sanitatum and you'd know that because the sign above the front entrance said so. The main entrance of the building was the more squarish of the building and once inside, there'd be a few ponies inside. Nurse's speaking with some patients that were currently being checked in for the flu, or a cough. Nothing exactly too serious. An Eldery Mare helping her husband walk. It certainly wasn't too busy like the usual big city hospitals, but at the same time it wasn't too empty like much smaller towns. At the front desk there would be a white furred stallion earth pony with aquamarine colored tribal markings on his face checking through some papers while sitting there. Tea Leaf seemed a little uneasy as they stepped inside the hospital; the stallion knew better than to be as rude as staring or making it obvious he was uncomfortable but he made an effort to give a slightly wider distance than he normally would have to those in the waiting room as he made his way to the front desk. When he reached the desk he politely tipped his hat to the reception worker. "Hello there, Tea Leaf and Verde Tin here to visit Heartstring?" He asked of the receptionist, assuming that it would be a simple matter of asking to see him. Verde pauses a moment as they approach the hospital, looking it over with genuine interest and curiosity. "Occultae Sanitatum, huh?" she remarks as she resumes walking. "Old languages are old, but pretty bucking cool too." She colors very slightly. "Err... I mean... they're very, very neat as well. Sort of outdated terminology--I doubt this place is designed to drive spirits out of the insane--but I still heartily approve." In sharp contrast to Tea Leaf, Verde seems very comfortable in the hospital, looking around with the fascination of someone who's used to the sights and smells of a medical facility and is comparing what she sees in this one to what she's experienced in others. "My Auntie Silver Rose works in the Canterlot Royal Hospital," she says to Tea Leaf as they walk to the receptionist. "It's pure chaos there, somehow kept under tight management by a small army of ponies who always seem to know what to do when and how to get whatever pony wherever they need to be to get help. It's a monument to effective management, as well as all the other great things like selfless compassion and healing and the rest." "Yeah, I've had to pay a visit to that place on more days than I care to admit." Tea Leaf admitted as Verde talked about Canterlot Royal. "Mostly my usual travelling partner deciding that all of life's problems can be solved with headbutts and buck kicks, and then finding out some things actually kick back." The stallion shifted a little from hoof to hoof as he spoke; he had started displaying it once they had begun their stay here, almost as a nervous tic. "I wonder still if Heartstring or his family will keep us in the know." Tea Leaf said, dropping his voice; from his saddlebag he produced a vial half full of black dust that looked like soot, the remnants of the crystal that had called his leg home in the Crystal Empire. "Call me paranoid, but I don't trust that we have the whole story, not yet." Verde shrugged. "Of course we don't have the whole story," she said in a tone that very clearly indicated mild surprise that this wasn't obvious to him. "You never get the full story from someone else. Either they don't want you to know, or they don't know themselves. Or some details are blurry to them and they can't really explain, or they've forgotten something, or regard a fact that's important to you as inconsequential and fail to share it because they don't know that you find it important. All of that, however, assumes that Heartstring and family and friends know everything about what happened and aren't sharing, which is a pretty large leap." She beams to him. "Besides, them giving us the full story completely ruins the fun. There's nothing more fun than snooping around and collecting all the little bits and pieces of the truth and putting them together in clever ways to create hypothesises and from there, test our suppositions against the results of further investigation, until we have established the true facts. From true facts can then grow furtehr connections and more testing, until we learn everything we need or want to know." Her eyes seem to glow with excitement. "We can then go far beyond the bounds of simple reality and start adding the facts together in strange and innovative ways to reach conclusions that are completely insane and yet... and yet..." She gives him a maniacal grin "...two and two make five!" She pauses, panting a little, before her insane glee turns into something completely normal and not-disturbing. "So don't get all paranoid. This is gonna be some good fun, trust me." The stallion glanced at the two ponies a moment before pulling a thick folder and flipping it open. his hoof flipping through several pages before landing on one page and going down the list. "Ah, yes, right here..." he uttered and nodded his head looking back towards the two. "Building 5, Room 12, go right ahead and follow the blue line, it'll lead you all the way to building five." Along the ground there were several lines of various colors. The blue line was amongst the colored lines that led to various areas. All the lines driving towards a door past the counter. Three lines splitting off towards the right and two towards the left. The blue line was one of three that lead towards the right. Each line led to a diferent building and cut off once they arrived to their specified buildings. "Well, it's not quite as interesting as following a road with colored cobblestones to a place where magical help can be had, but an adventure nonetheless." Verde beamed cheerfully. "C'mon then Tea, time to go check up on our personal beacon of deceptively powerful and highly fabulous stallion." She starts down the blue line in the floor with a cheery spring to her step, tail swishing and flanks flexing in time with her movements. "Does everything you say just turn into a poem or is it a practiced skill?" Tea Leaf deadpanned with a grin as he followed Verde down the hall to Heartstring's room. "Got to say, this is a lot more welcoming than most hospitals I've been to; most of them I just kinda want to turn around and scarper in the other direction as soon as I set hoof in them." The stallion's eyes were glancing around at everything as he passed but for once he didn't seem to be eyeing up valuables, rather he seemed to be simply trying to take in the majesty of the mysterious place they were in, even in such a usually depressing and downbeat place as a hospital. "Anyway, I think this is Building 5?" Tea Leaf said, once they had reached the end of the blue path. "Hope he's able to take visitors for a time; I don't know about you but I've been bursting to have answers since we left the Crystal Empire, and not everyone here is overly forthcoming with knowledge."